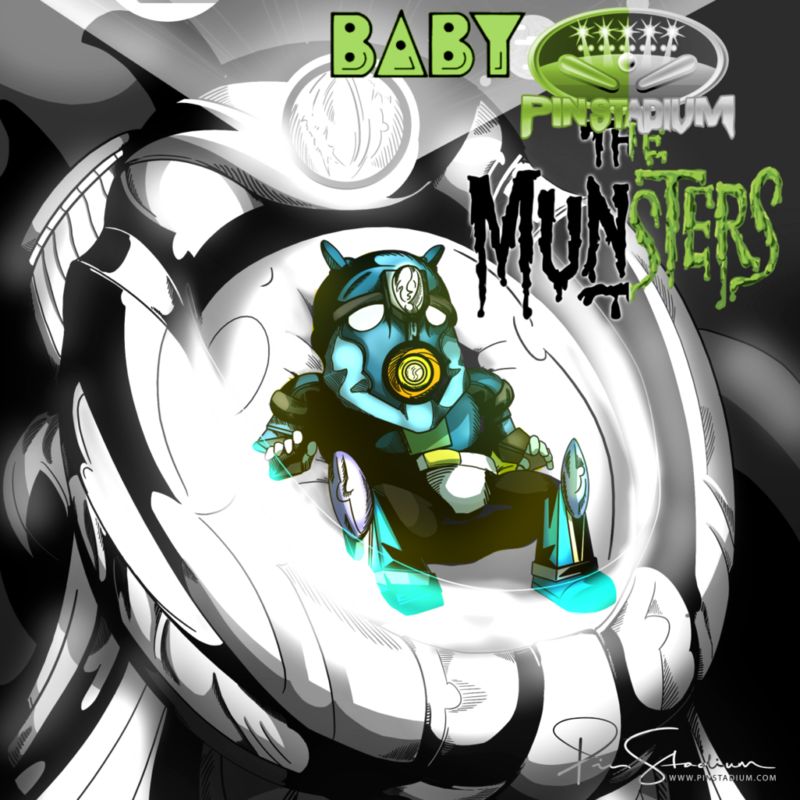 PAPA/IFPA approved and endorsed for competition, streaming, and collectors. Also many well respected in the community love them too. Just ask them! #1 Mod of the year award! 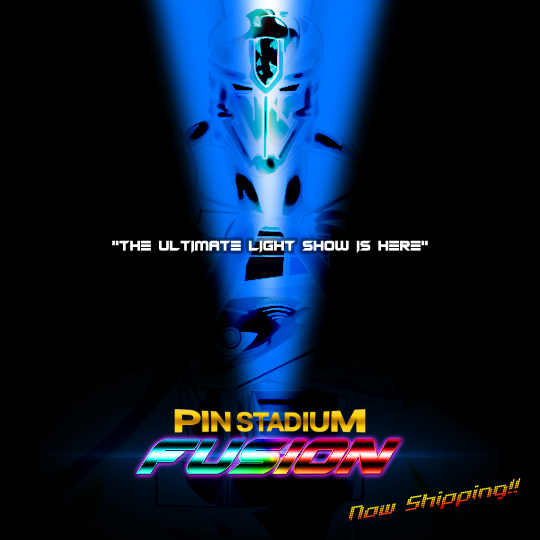 Pin Stadium Lights were formed from a simple idea to create a pinball LED lighting solution for our collection- one that did everything on the wishlist when it came to enhancing the experience of an already awesome machine. The first inspiration for this project was a mint condition (HUO) Stern Lord of the Rings 2003. This game already had been retrofitted by the previous owner with a complete LED kit for the inserts and GI. However, it still had many large dark sections, thus leaving a lot of room for improvement. The LED inserts were bright but the common problem today with this is that it creates more contrast with the darker surround playfield that it makes it very difficult to see the ball. Spotlight installations didn’t work either, as it just made the areas where they didn’t shine seem even darker. Also they are very time consuming to install and are visual eye sores with physical interferences during game play (i.e. they block sections of the playfield and ball hang-ups). Our goal was to brighten up the general illumination (GI), and create an interactive experience that integrated with Balrog during battle mode. Next came the biggest challenge– to create a mounting design that was discreet with a factory appearance that did not require any permanent modification to the pinball machine. After test driving the newly mounted lights for several months, we realized the design still needed some fine tuning. One aspect we craved was to provide better quality general illumination (GI) to the playfield in addition to the enhancing flashers. So, we integrated a bi-level lighting system. This combination brought light to once dark areas, reduced shadows from other pinball LED lighting mods such as spotlights, and prevented that tormenting glare or reflection on the DMD and back glass. The quality of light was our next focus for area of major improvement. After trying several over the counter LED lights, led strips, bulbs, and mirrored housings we found nothing suitable or of any lasting quality. 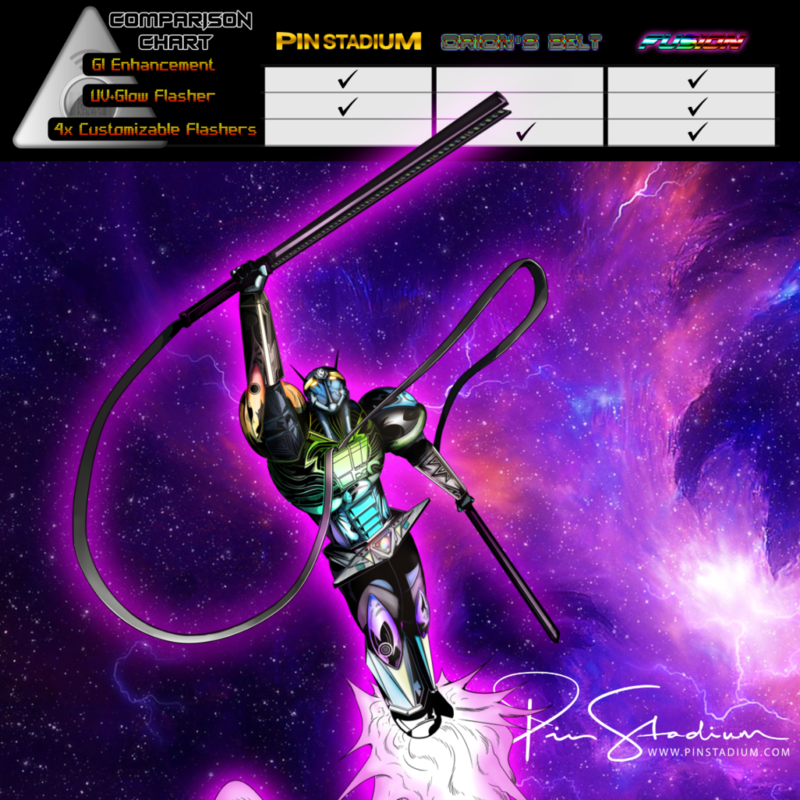 All major components of our kit are custom designed by us and made specifically for Pin Stadium. Not a cheap thing to do, but once you see them in person it will be very clear why we went the extra mile! The pinball machine needed better white GI lighting that the RGB could not provide by itself. For those who are familiar with what “white” means when it comes to RGB lighting, it means that each of the red, green, and blue LED lights come on at the same time to create a “simulated” white look. The quality of this type of light is dim and sub-par, similar to a washed out faded rainbow color. 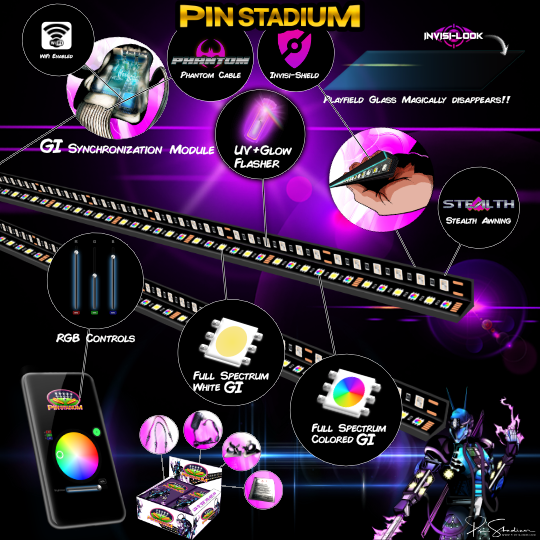 As a result, we integrated RGB and white lighting that allows for separate independent control of each along with brightness control for each of them in the Pin Stadium app from 0-100%. 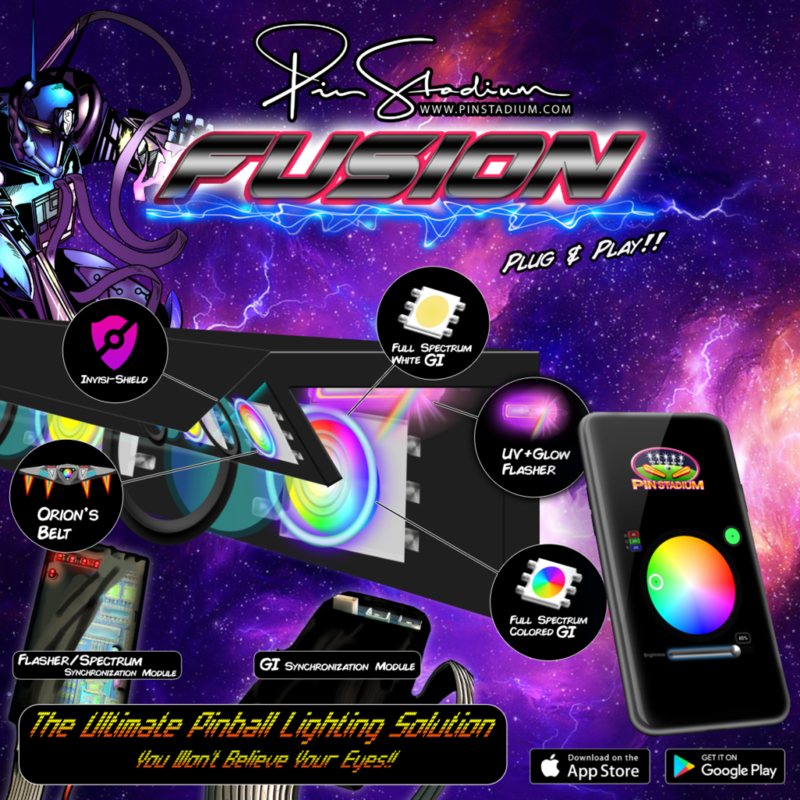 This gives limitless possibilities to the levels of brightness and color spectrum far beyond what was possible with other pinball RGB LED lighting. 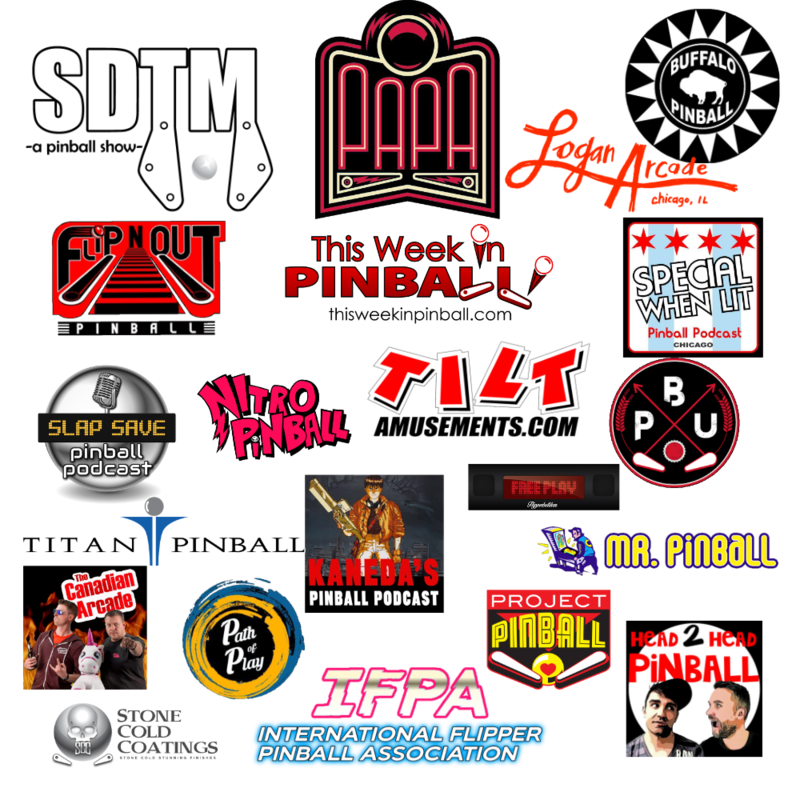 As many pinball collectors know, playing with color choices is an individual preference and is specific to each different pinball playfield. So if you want just a little light for an eerie look you are covered and if you want to give the most amount of light possible you can do that too. Our predefined out of box settings are designed to satisfy but we encourage you to explore and customize your own colors, patterns, and brightness levels. You can unleash the power with our app available for both the iPhone and Android. So, for example, you could have the multi-colored GI dialed into a specific color and set to 80% brightness while the white is set to 65%. Even better is that we custom design our LED PCB board and LED chips for the ultimate reliability, color quality, light throw angles, and overall performance. Every single LED in our system is custom made specifically for the Pin Stadium and our lighting system. Take a look at our Before and After gallery to see the results yourself. Bottom line is that this is a game changer for your pinball collection. Be sure to check out the video reviews above and below! A lot of work goes into these to build them and they are all made here by Pin Stadium. Every aspect of the build process is done in-house. Even the LED’s that are used are custom PCB and LED chips that were designed by Pin Stadium and custom engineered/manufactured for our specific application for our lighting systems. This was not cheap for sure and the extra time, effort, and cost is way worth it. They are manufactured to specs that are above and beyond, due to our background in working with lighting applications for corporate and entertainment purposes. This is what gives delivers the superb performance that you will never find with off the shelf LED. 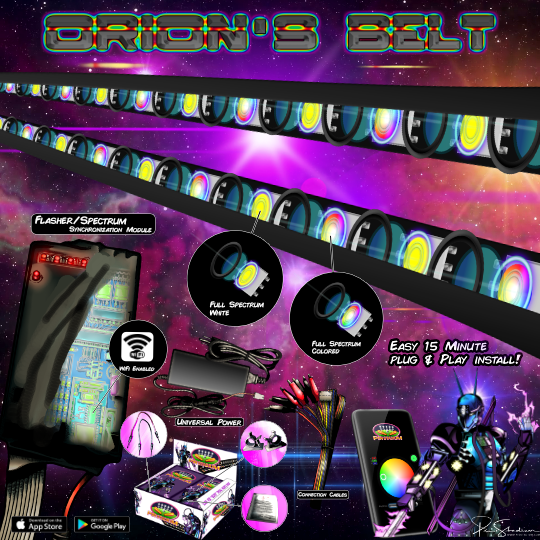 This is just a taste of what goes into these and is what makes the effect you see on your playfield so impressive while also allowing these to last the life of the pinball machine with our solid state circuitry. Now that is quality! Needless to say, we are very particular about not just the manufacturing aspect but also our intensive build process. It’s a lot of hard work to build these and every part of the Pin Stadiums are custom made and designed to our specs: light bars, GI Module, Magna-Mounts, LEDs, PCBs, ribbon cables, UV+Glow flashers, flasher integration circuit, GI/Flasher harnesses, plug and play power adapters, and our super advanced iPhone and Android app with even more features to come in version 2.0. Wait until you see what we have in store for you! All of these factors are what gives the Pin Stadiums the tremendous quality of light and huge impact on your playfield. We appreciate the opportunity to detail this to everyone considering purchasing these for your pinball machines. It is important for you to know what you have sitting under your glass.